During the holidays, your fireplace provides so much more than ambiance and comfort. This is the time of year when the hearth takes on extra prominence as the most beautiful holiday focal point in your home! In fact, there are so many ways to dress up your mantel for the holidays, your “Christmas fireplace” may attract even more eyes than your holiday tree! We’ve made it easy for you by organizing mantel decorating into a few simple steps. Carry those boxes of holiday décor and lights up from the basement, gather the family together and make decorating your fireplace mantel a holiday tradition! Don’t have a mantel? Many of these ideas can be created on a sofa table, cabinet or piano, too. The holidays are the perfect time to try something new for the centerpiece on or above your mantel. Instead of an oversized mirror or picture that’s displayed 11 months of the year, try a big wreath above your mantel. Or keep the mirror there and dress it up for the holidays with shiny and glittery holiday décor and picks. Adding a sign of the season or a chalkboard with season’s greetings can give your décor a traditional, spiritual or festive theme. Next, add complementary trim to your mantel. Evergreen garland draping the mantel or boughs on the mantel itself will give it a holiday feel. For a less conventional look, try strings or branches of berries, or gold, white or red ribbon and bows for a distinctive hearth. Strands of beads can add glimmer to the evergreens, berries or ribbon. 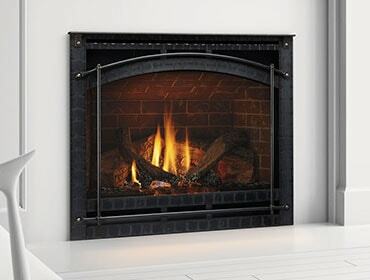 Remember fireplaces make fire – be sure the garland is a safe distance from the firebox and/or potential sparks. Fill out your mantel décor with special holiday keepsakes, figurines, nutcrackers, a small poinsettia or a manger scene, and, if you’d like, stockings. Pine cones can be an easy (and inexpensive) adornment for your mantel. To add more glimmer, fill clear apothecary jars with glass tree ornaments, or hang the ornaments directly to your garland or trim. As this photo suggests, you can use colors other than red and green. Gold or silver or any “winter” colors like white, blue or pink also work beautifully. Lastly, let there be light! Candles of varying sizes, placed inside of hurricanes for safety, add a touch of sophistication to your hearth. Shorter candles can be used for mood lighting while taller candles can frame the centerpiece above your mantel. You can also weave electric twinkle lights into the garland or trim on your mantel. They will provide a romantic glow that’s second only to the flame in the fireplace. Looking for more décor ideas for your hearth? Check out these ideas from Houzz and Country Living, or our Seasonal Celebrations Pinterest board. As you gather your family and loved ones around the fire this holiday season, make the most out of your time together. Here are some ideas for Fireside Family Fun During the Holidays.